The votes are in for your must-have gadget or gift for £5 or less! Caravans and motorhomes come with all kinds of weird and wonderful gadgets. And with Christmas only weeks away it has to be time to start thinking about a cheeky little stocking filler for the avid tourer…? 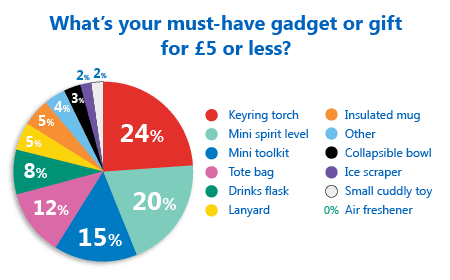 Let’s find out what your must-have gadget or gift for £5 or less is as we reveal the results of last month’s poll. Robert Jackson Crisp suggested a torch and James Pennington said he looks out for offers on motorhome tools and other camping items at stores such as Aldi and Lidl! The tote bag came in a close fourth – it’s become a necessity to have one of these to hand now as the supermarkets and big retailers have started to charge 5p. And in fifth place it was the good old drinks flask – we know they’re popular as we gave all of ours away at last month’s NEC show! Less important to you was a lanyard to keep your keys safe around your neck or an insulated mug, with just 5% of the votes, and surprisingly the collapsible bowl got just 3% of the votes and the ice scraper 2%. Not many of you fancied a cuddly toy to snuggle up to, with just two votes overall and nobody voted for an air freshener – your cars and motorhomes must smell nice enough! Do you agree with the majority verdict? Share your thoughts and stories in the comment box below. We’ll have another poll for you to take part in soon! I’m surprised that a mini spirit level is in the number two spot, as a glass with a little water in it, strategically placed on a worktop or table, so as to be viewed from the drivers seat, will act as a level in all directions. If no help is available, Blue Tack or double sided tape will stabilize the glass whilst positioning the vehicle.